Peter Rabbit (James Corden) is still very interested in Mr. McGregor’s (Sam Neill) garden. After all, it is a bounty for rabbits and all wild animals, filled with fruits and veggies. Only now, since Mother Rabbit has passed away, Peter has enlisted his three sisters, Flopsy, Mopsy, and Cottontail as well as Benjamin Bunny to be the look-outs for him as he enters the garden. Then, too, a kind lady neighbor-artist of McG’s, Bea (Rose Byrne) tries to guard over the animals, for she dearly loves them. In most cases, this works out very well and Mr McG has not filled the hole underneath the gate where Peter can escape. One fateful day, however, Peter is caught and seems doomed. That is, until old Mr. McG hits the ground, a victim of a heart attack. The “ice cream truck” with the red stripes takes him away. Joy of joys, the animals now move in the house and eat freely from the garden. Its heaven! But, the tale is not over. A stuffy toy store manager and great nephew, Thomas McGregor (Domhnall Gleeson) comes to the country with the purpose of sprucing up the house and grounds to sell, as he prefers London. On the night of his arrival, what a shock, as he has to boot all the wildlife outdoors. In short order, Thomas begins to spiff the house AND repair any way into the garden via fences, gates, holes, etc. Peter and his family are dismayed. But, once Thomas meets Bea, things start to change. Maybe the country isn’t so bad, after all? Yet, because she loves her bunnies, Thomas has to display two faces, depending on whether the creatures are near. Can Bea trust Thomas? Can Peter and the others change the man’s mind about the beauty of all living things? What if his former life as a businessman comes beckoning Thom again? We shall see! What an absolutely delightful film this is, sweet, beautiful and funny. So many of Potter’s animal friends, including Mrs. Tiggywinkle, Mr. Jeremy Fisher, and others show up to play support for Peter and his family. 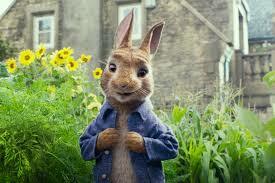 James Cordon does a great job as the voice of Peter Rabbit. We’ll see him in two more animated movies this year: Smallfoot and Ralph Breaks the Internet: Wreck-It Ralph 2. He’s probably hoping everyone will forget he was in The Emoji Movie. Other voice talent includes Sam Neill and a cast of very lovely ladies: Daisy Ridley, Elizabeth Debicki, Sia, and Margot Robbie. Domhnall Gleeson is perfect, just like he is in everything else he does. Cute beginning. Quick intro to all of the characters with some humor. Very expressive animation with incredible details. Some of the original Peter Rabbit animation design is shown as a respectful nod to the past. Upbeat soundtrack. I liked the enthusiastic rooster’s reaction to each new day. We should all feel that way when we wake up! It’s sweet when their foreheads touch. Keep watching during the rolling credits at the end. Funny deer gag. Peter Rabbit’s motivation is much deeper than you would expect. Parents aren’t going to mind watching this with their kids. When Bea and Tom play Scrabble, she makes the word “Potter” in honor of the author of the original The Tale of Peter Rabbit, Beatrix Potter. Very fast moving in action, gags, and jokes.